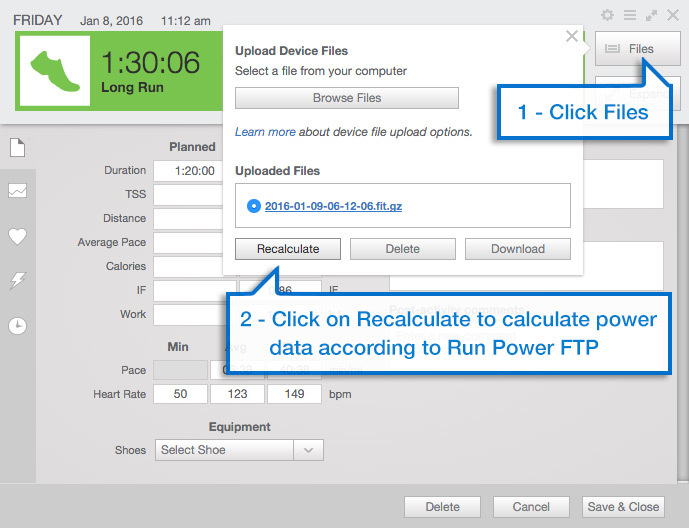 If you are now currently using a power meter for running, like the new Stryd or RPM2 products, you likely are wondering how you can utilize the tool to maximize the benefit of the technology in your training and racing. Power meters for running are a very new technology, and there is still a lot to learn ahead. However, to begin using it effectively to learn about your training and training response, you should begin as you would if you were using a cycling power meter. The first thing you should be doing is simply performing your normal training and observe the data as you train. Track the data and see how the numbers fluctuate or correlate with different intensities, different inclines or declines, and more. Don’t try to control your training based on the power numbers, as you don’t have a baseline for what they truly mean yet. At first, collect the data from your normal training and see how the numbers are trending. When you feel you are ready, you can then test for your run Functional Threshold Power (FTP). Now, if you’re a triathlete who uses power on the bike, this number will not likely be the same as on the bike for you. In fact, it is likely larger than your cycling FTP. So don’t try to use that value. Be specific and set your run functional threshold for power, or what I call, rFTPw. 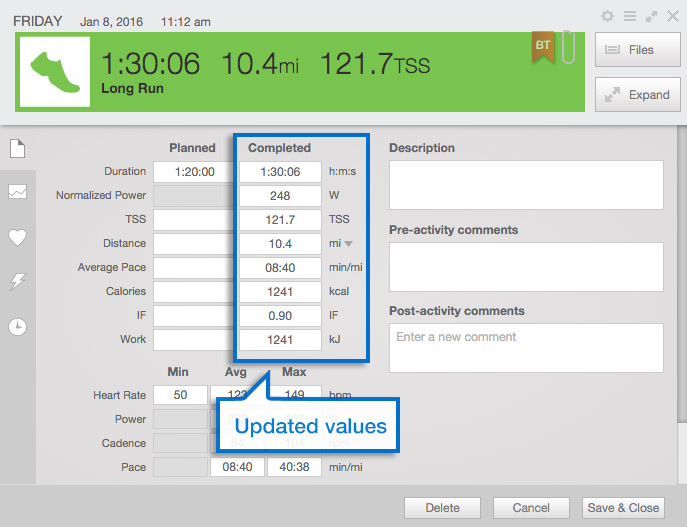 If you’re a runner, you likely already use threshold pace in TrainingPeaks, or what I call rFTPa. I use these terms so not to confuse them with cycling, and especially not to confuse both pace and power when comparing or discussing FTP. After you have completed this test, take the average power for the 3 minutes and the 9 minutes, and average the two values. For example, if you did 350 watts for the 3 minutes, and 300 for the 9 minutes, you would get a 325 average of the two. Next, take 90 percent of that value, which is within about +/-3 percent of your actual value if you paced the efforts correctly, as all-out. So the 325 average, would be an estimated rFTPw of 293 watts. Next, you simply need to go into your zones in athlete settings, and set that value for Run Power. 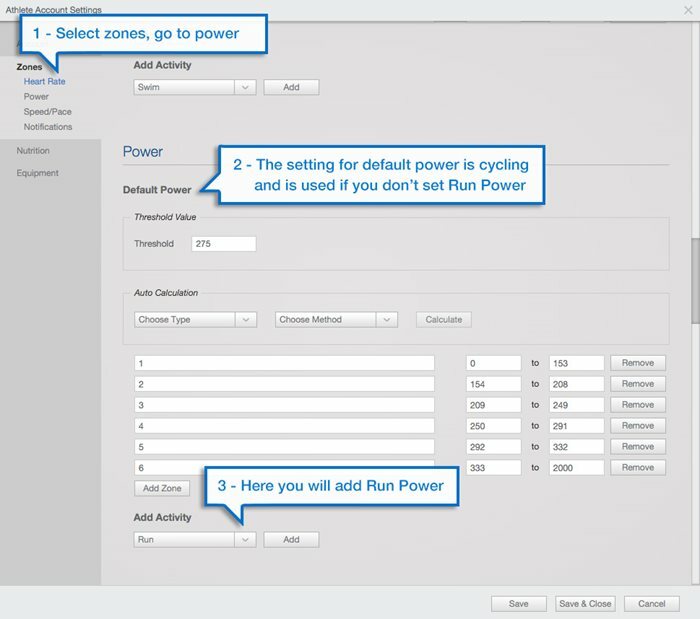 It is critical you NOT change the “Default Power” value, if you use a power meter on your bike, and want those files not to be affected. If you’ve been using your bike FTP as the only value for power when uploading running power files, your Intensity Factor® (IF®) and Training Stress Score® (TSS®) values are likely way off, so this should help quite a bit. 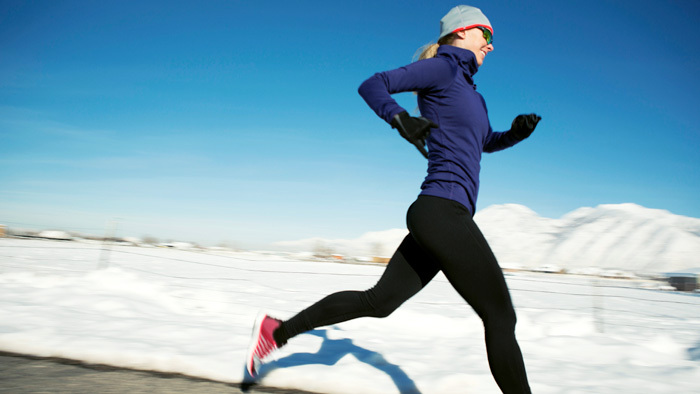 The following shows you how to set your Run Power in your athlete settings. 1. Open your account settings, click on Zones, then Power. 2. 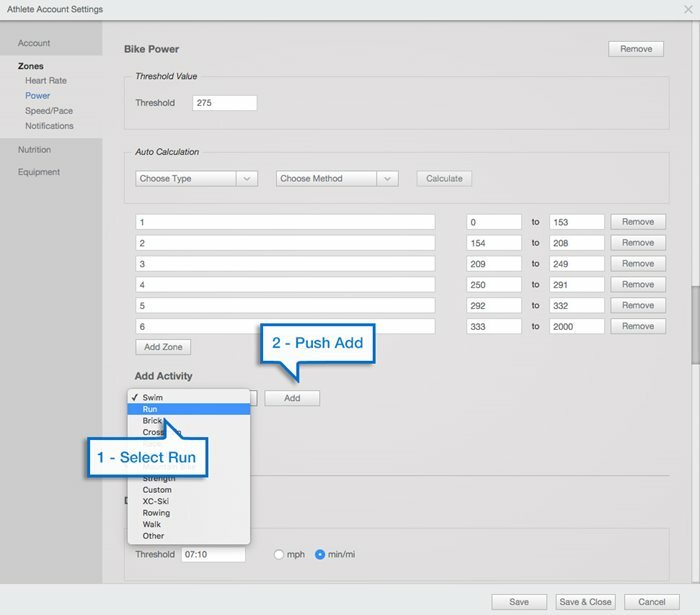 Go to the Add Activity drop down, choose Run, and click on Add. 3. 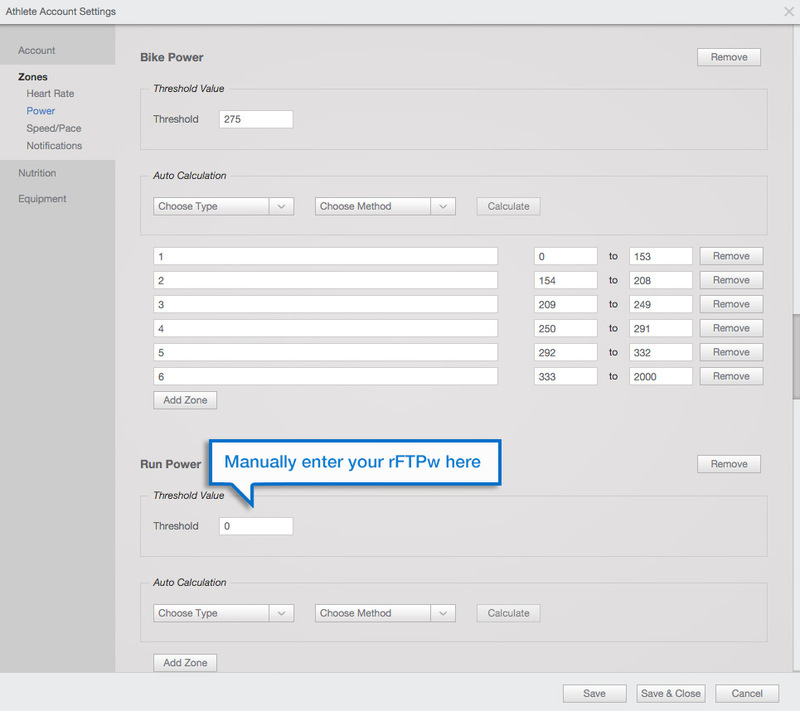 Manually enter your rFTPw in the Threshold Value box. If you’ve done this before with cycling, your habit is likely to then set zones. My advice is NOT to set zones at first. No, you don’t have to set them, and not having them it won’t affect things negatively. The current available zones, while excellent for cycling, don’t apply with run power meters. Trust me, I have researched it, and I will be coming out with my running power zones in another post soon, that work effectively for you. In the meantime, just gather some data and see how your Variability Index®(VI®), IF, and TSS values calculate based on easy efforts, hard efforts, and everything in between. If you’re not seeing the TSS, NP, IF, and other values you want on this summary window, you can also change those in your athlete settings. 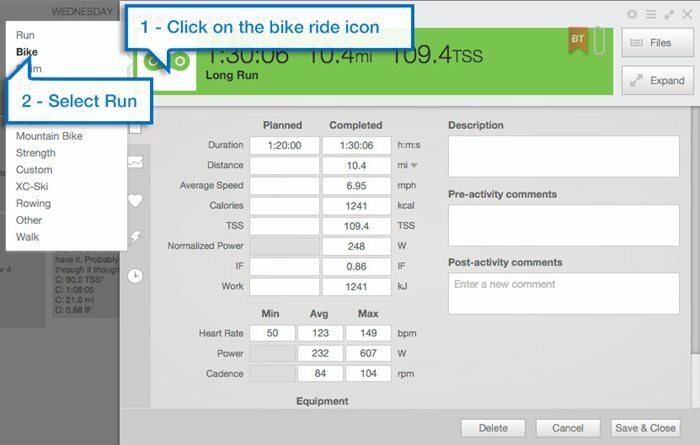 Once you do these changes in your settings, you should find yourself getting a lot more from the data your power meter is giving you. I will share more posts soon on how to better use your running power meter. For those that are interested, you can find out more about running with power here. Jim Vance is a Level 2 USAT Coach, an Elite Coach for TrainingBible Coaching, Head Coach of Formula Endurance, and is a former elite triathlete. You can find his training plans in our store here.